For a while now I have been suspicious that physician burnout rates are increasing here in the USA, especially in the last five years or so. I have been waiting for the research to catch up with my suspicions for a while now. Here is the smoking gun. Mayo Clinic Proceedings this month published results of round two of their survey of burnout in physicians compared to burnout in the "normal population". The last round in 2011 was major news across the country and the first study that compared physician burnout rates to those of non-physician workers. The burnout rates are what I expected. The shocker is the number of physicians screening positive for depression and suicidal ideation that no one is reporting on. The Maslach Burnout Inventory was used to measure burnout in both groups. 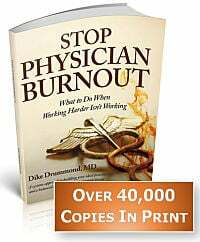 The physician burnout symptom that was the most common is emotional exhaustion. What failed to gain any attention is that 39% screened positive for depression. I think this slipped under the radar because this rate did not change between the studies. The rate of suicidal ideation in the last 12 months jumped from 4.0 - 7.2%. That is nearly double! "Work schedule leaves me enough time for my personal and/or family life." A database of 94,032 physicians was assembled via the American Medical Association Physician Master File. Physician Burnout surveys were delivered by email in August of 2014 with three reminder emails delivered over the ensuing 6 weeks. 35,922 physicians who opened at least 1 invitation e-mail were considered to have received the invitation to participate in the study. This 20% response rate is average is normal for surveys of this type. There is no data on how the non-responding 80% would have filled out the survey. All we know is this population of responders is a statistically valid sample of the larger population with regards to demographics. From my work with thousands of burned out physicians and dozens of the organizations that employ them, here is what I take from the study. 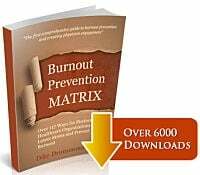 The burnout prevalence in YOUR ORGANIZATION is probably right around 50% too - no matter how much you might wish that were not true. Unless you have a proactive, system-wide burnout prevention program in place your burnout rate may actually be higher than this. It does not have to be this way. 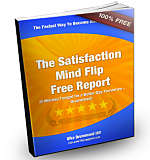 Here at TheHappyMD.com we have experience with hundreds of physicians in all specialties showing that simple changes in awareness and new actions applied over time can reverse and prevent burnout. There is no rocket science or black box of mystery here. We need to fill in the holes in our medical education and be actively involved in building a less stressful workplace. Suicidal ideation is surprisingly common - THAT is the scary statistic here. This is why we always recommend a 24/7 physician crisis hotline and a proactive crisis intervention program for all organizations that employ physicians. This service must be well promoted and highly visible in order to garner participation from the doctors. 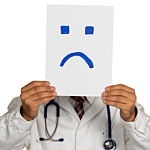 Despite the constant presence of burnout concerns in the healthcare industry and the exploding popularity of the topic of physician burnout - effective prevention tools are not being disseminate widely enough to effect the trend of increasing physician burnout rates. We here at TheHappyMD.com have not reached nearly enough doctors yet with our tools to prevent physician burnout. Not by any means. Here is our Mission. This level of physician burnout interferes with our ability to offer quality of care, however that is not my main concern as a change agent. My concern is this level of burnout makes it extremely challenging for doctors to pull their heads up and play a meaningful role in the redesign of the workplace necessary to reverse this trend. Continued prevalence studies are meaningless here. It is time for action to treat and prevent physician burnout, rather than continue to run simple studies like this to pad your bibliography. Sheesh I wish the academics would do the hard work of measuring effectiveness of prevention efforts with the same vigor as they complete these simple survey studies. What is your estimate of the physician burnout rate in your organization? What is your leadership doing to prevent physician burnout?